Introduction: Attitude assessment is essential to solve the multidimensional puzzle of stuttering. The Stutterers' Self-Ratings of Reactions to Speech Situations (SSRSS) serves this purpose. In spite of its clinical applicability, limited literature is available on its development and validation. 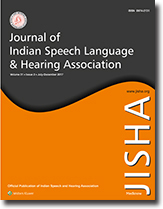 Further, while many limitations stemming from stuttering would be culture specific, the SSRSS is still being used in its original form in India. The present study aimed at modifying the SSRSS to be culturally appropriate and obtaining preliminary normative data on the Indian population. Methods: The study was carried out in three phases where the SSRSS was edited through two versions. In Phase I, 16 persons with stuttering (PWS) and 16 age- and gender-matched typical speakers responded to the original version. In Phase II, qualitative data on potential changes in the SSRSS were obtained from participants of Phase I and from two independent focus groups of three PWS and three speech language pathologists, and changes were made to the SSRSS. In Phase III, 15 typical speakers filled in the final version. Results: Quantitatively, significant differences between scores of typical speakers and PWS reaffirmed the robustness of the SSRSS, while analysis of qualitative data brought out several pertinent modifications. Mean scores obtained from the original and final versions were not significantly different, establishing the utility of the final version. Conclusion: The importance of periodic revision of the existing instruments was emphasized. Clinical implications yielded by the qualitative analysis were underlined. Adding to the data pool using the Indian version was suggested as a future direction. Introduction: Adults with stuttering (AWS) exhibit longer reading rates and poor nonword recognition. This is attributed to deficits in phonological working memory abilities specific to language disturbances. 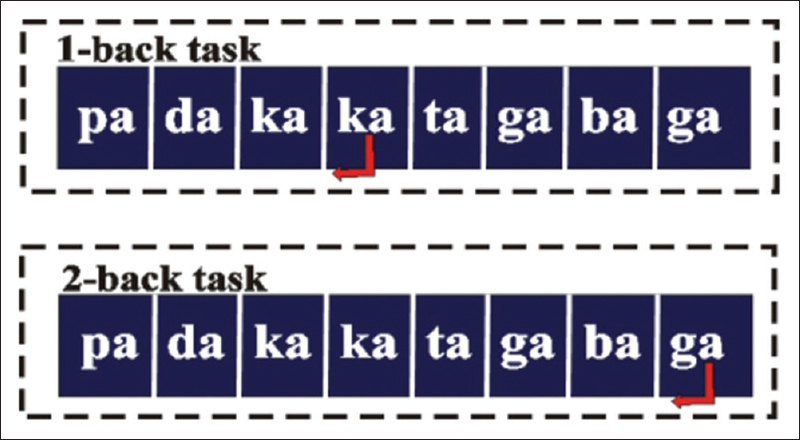 In the present investigation, working memory abilities of AWS was investigated using n-back test which is not sensitive to subtle language deficits. Methods: Participants included nine AWS in the age range of 18–26 years, and nine age, gender, and language-matched adults who do not stutter. The participants performed auditory 1- and 2-back tasks, where they pressed a button whenever the same syllable was heard as the one and two syllables before, respectively. The reaction time, accuracy, false alarm rate, and d prime (difference in z-scores of hit rate and false alarm rate) were calculated for an individual participant in each n-back condition. Results: Results revealed significant difference between two groups only during 2-back task. Analysis showed that AWS had more false alarms, which might have resulted because of the anxiety in responding, due to increased attentional demands, which is in turn reflected as working memory deficits during the difficult task. Conclusion: The present results provide preliminary evidence for auditory working memory deficits in persons who stutter. Introduction: The present study aims to profile the conversation behaviors of typically developing Tamil speaking male children in the age range of 3–5 and 7–9 years. Methods: The participants of the study were twenty typically developing Tamil speaking male children in the age of 3–5 years and 7–9 years. Ten mother–child dyads were videotaped in each group. The recordings were orthographically transcribed. Three to four elaborated topics were selected from the transcribed data of each child. Each topic was analyzed for the following behaviors: (1) topic initiation, (2) topic maintenance, (3) request for repair, (4) conversation repair, (5) nonverbal behavior, and (6) topic termination Results: Comparison of the younger children (3–5 years) dyad with the older children (7–9 years) dyad indicates a significant difference in orientation under topic initiation, conversation information under topic maintenance, responding to request under conversation repair, and nonverbal behavior. Discontinuous turns and abrupt topic termination were present only in the younger group dyad. 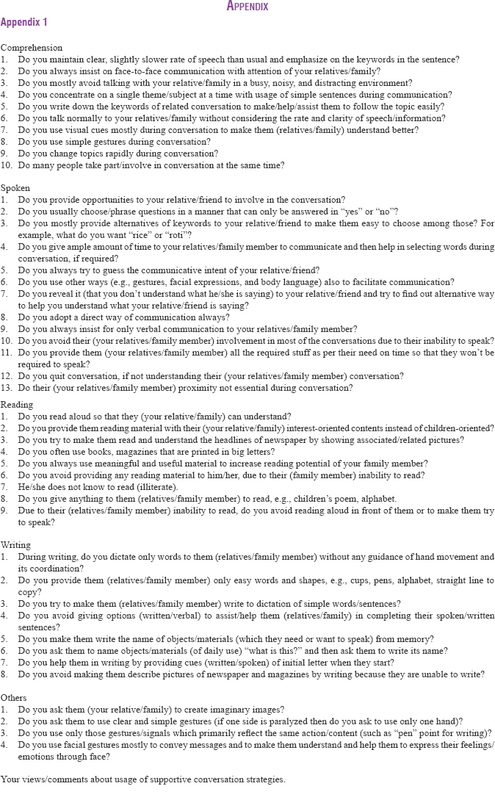 Conclusion: This quantitative approach provides a method of measurement of the conversation behavior. This knowledge will be helpful for making assessment and planning for intervention for children with conversation difficulties. Introduction: The spectrum of useful and not-so-useful supportive conversational strategies (SCSs) employed by significant others (SOs) of person with aphasia (PWA) is wide and variable. The SCS might be influenced by many factors such as perceptions, attitudes, and awareness about the handicap. Modeling and training of SCS might help in modifying perceptions, attitudes, use, and its practices that hinder progress of PWA. Knowledge and understanding of these factors among SOs and PWA will enhance rehabilitation strategies. The objective of the study is to develop SCS-based questionnaire and to examine the type of SCS used by SOs of PWA in the daily communication situation to support and stimulate PWA as a home-based practice program. Methods: The study design was qualitative descriptive trail, involving semi-structured interview of SOs of PWA. Questionnaire was developed and validated. Responses of 33 SOs were obtained and analyzed on this questionnaire. The mean age of PWA was 52.6 years; 85.5% of SOs were a cohabiting partner. Results: Responses to the questionnaire regarding the structure and content showed the agreement levels ranged from 90% (Md. 4.5) to 98% (Md. 5.0). The correlation coefficients varied from 0.57 to 0.94. The overall reliability was high (r = 0.90, P < 0.001). SCS based on verbal or nonverbal mode is exclusively used by SOs for comparing reading and writing mode. The later modes are not utilized by approximately 60% SO. Poor SCS use might hinder expected functional communication. Conclusion: Investigation related to SCS would help to plan tailor-made family-oriented home training program and to understand its efficacy in aphasia. Introduction: Pitch is important for perception of speech. It is an imperative acoustic cue for differentiating gender, age, emotion and culture, etc. In certain languages, pitch also changes the linguistic meaning of the word. Mandarin, Cantonese, Thai, etc. (tonal languages) are few such languages where the pitch contour varies the meaning of the word. Researchers reported that language tone and pitch contour influence the pitch perception, but the results were inconclusive. The role of linguistic meaning was also sparsely investigated in the context of pitch perception. Thus, the present study was designed to assess the influence of language tone, linguistic meaning, and pitch contour on the perception of pitch. Methods: Fifty adult Mandarin and Kannada speaking individuals were selected, and their pitch perception abilities were measured using a 15-step categorical perception paradigm. The stimuli were Mandarin meaningful and nonmeaningful syllables varying in their pitch contour from rising to falling fundamental frequency in one set and falling to rising fundamental frequency in another set of continuum. Results: Univariate ANOVA was used to compare the effect of language background, linguistic meaning, and pitch contour on the perception of pitch. Results indicate no significant effect of linguistic background (P > 0.05) and linguistic meaning (P > 0.05), but the mean values were significantly different across pitch contour (P = 0.001). Conclusion: The language tone and linguistic meaning have no significant influence on the pitch perception, but the categorical boundary was wider for Kannada language participants and for nonmeaningful stimuli. Pitch contour significantly affects the perception of pitch. There are differential perceptual processes which are dependent on the native languages. Introduction: Ability to tolerate noise and speech perception in noise (SPIN) are important auditory skills for adults and children, with and without hearing loss. Acceptable noise level (ANL) and SPIN are tests used for the evaluation of these processes. The present study aimed to develop normative data on ANL test (monotic and dichotic) in typically developing children and adolescents using Marathi versions of the test. Methods: Thirty typically developing Marathi-speaking children and adolescents in the age range of 8–16 years were tested using Marathi versions of ANL and SPIN tests. Results: Median scores and interquartile ranges were developed. The scores were in agreement with those obtained in adults. More than 90% of children had low ANL scores of ≤3 dB showing excellent ability to tolerate noise and none showed high ANL. The dichotic ANL was significantly lower than the monotic scores, implying the advantage offered by spatial separation of speech and noise on the ability to tolerate noise. However, the scores obtained in monotic versus dichotic conditions were not correlated. 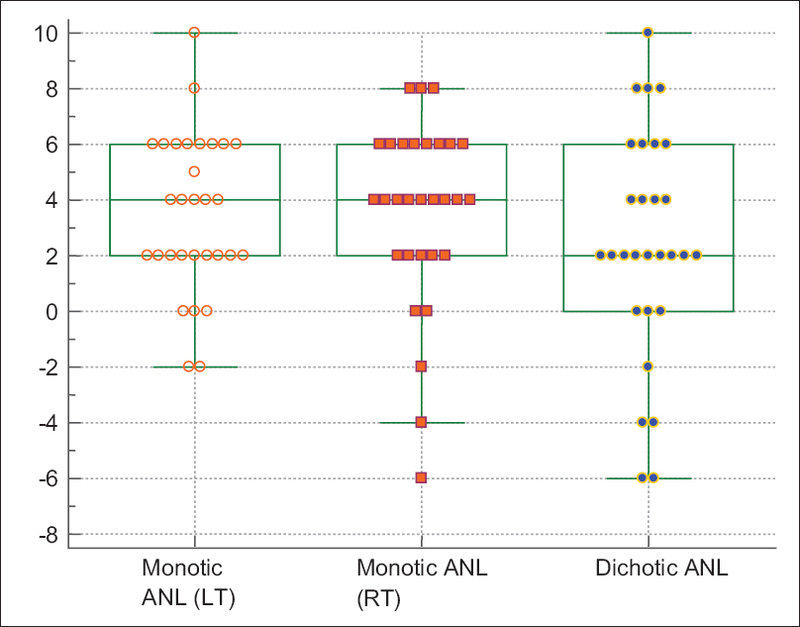 There was a negative correlation between monotic ANL scores and SPIN scores (weak correlation in the left ear and moderate correlation in the right ear). 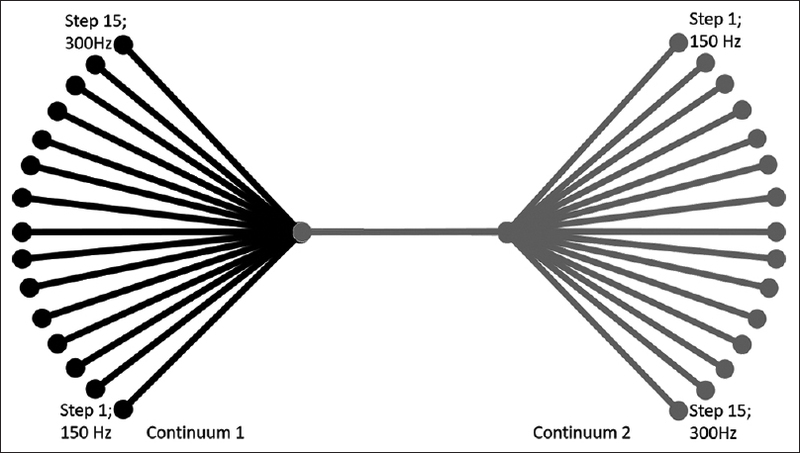 Further, the ANL scores in dichotic condition did not correlate with SPIN scores. Conclusions: Children show ANL scores similar to adults. The processes underlying ANL and SPIN tests are not completely independent in children. The study does not support the role of binaural processing at higher auditory centers in the ability to tolerate background noise in children and adolescents.